components, these heavy duty air transporters are rock solid in operation with the ability to lift and move 300 tons with pin-point precision and accuracy. Heavy duty air transporters are available with capacities ranging from as little as 15 tons, and with many options such as lift-deck units, built-in steering and guide control, external tugger control, and joystick or wireless operation. All heavy duty transformer and load movers are powered by a series of air bearings incorporated into a lower deck. Steering is by way of integral drives which offer pin-point accuracy in positioning as well as true omni-directional and 360 control. Standard transporters offer a flat deck area with pendant control. Size is per customer’s requirements and specifications. All heavy duty transporters can be customized to interface with the customer’s equipment. See green transporter example below. Options available include a lift-deck assembly – powered by air bearing lifters – which allows the transporter to slide under the load and lift it away from its berth before moving to its destination. Tugger power control is also available for smaller transporters, and offers motorized steering and air delivery control. Operational control is usually by way of joystick control unit or a wireless control panel. All options can be seen on this below. 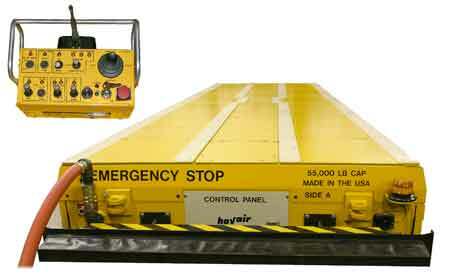 Here are some examples of Hovair Systems heavy duty air transporters. Here is a fabricated steel transporter with customized upper structure to interface with customer’s equipment. Air bearings incorporated into the lower deck provide the lifting power and the ability to float the load across the floor’s surface. Operation is by tugger control and weight capacity is 20 tons. Designed and built for the United States Navy. This heavy duty transporter was designed and built for “clean room” operations within the Lockheed Martin Corporation. It has a 50,000 pounds (25 tons) weight capacity, includes integral steering control and is operated by joystick control on external panel. Integral steering control offers true omni-directional control and pin-point accuracy in positioning. This transporter requires no external power to run and operates solely on compressed air and internal battery power. the operation to halt if either bumper is activated. Operational mode is signaled by flashing beacons and audible warning alarm in both forward and reverse modes. Pin-point accuracy and positioning is by way of integral steering control.